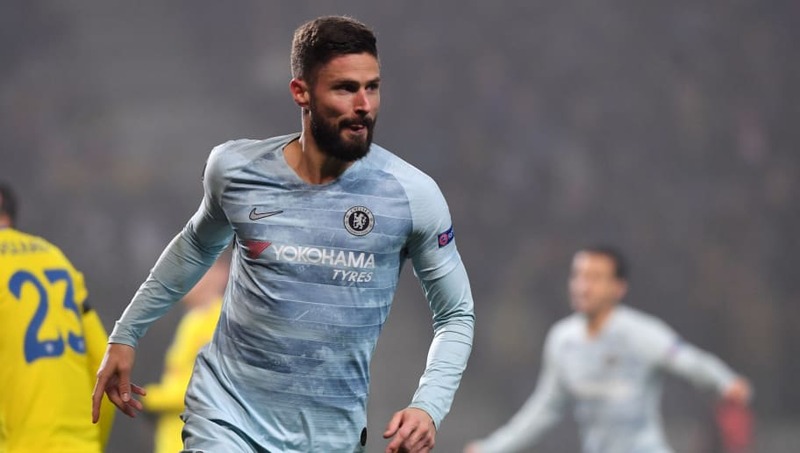 ​Chelsea qualified for the Europa League knockout stages after a 1-0 win over BATE Borisov on Thursday night, thanks to an ​Olivier Giroud header. The win in Belarus sees the Blues qualify from Group L and confirm their place in the round of 32, with two games left to play. BATE had the first chance of the game, as Baha’s long shot crashed off the crossbar. Moments later, Arrizabalaga was forced into his first save of the game, pushing away a close-range header. ​Chelsea finally broke the deadlock in the 52nd minute, as ​Giroud headed home Emerson's cross to score his first goal of the season. BATE then had two huge chances to equalise, with Signevich hitting the woodwork and Rios smashing his shot over the bar. The Belarusian's then nearly grabbed a last-minute equaliser, but Berezkin's volley shot off the post as Chelsea held on for the three points. ​Here's 90min's breakdown of Thursday night's clash in Belarus. From watching their performance at Stamford Bridge a fortnight ago, there seemed to be little to expect from BATE. However, this time they were much more organised, much stronger and much better overall. They were the better side in the first half, and had great chances throughout the game. In the end, BATE were unlucky. They played well and pushed Chelsea to their limits, but in the end they couldn't resist the visitor's attack and fell to their third consecutive loss in Group L.
Starting XI: Scherbitski (7); Rios (6), Volkov (6), Filipenko (6), Filipovic (6); Baga (7), Dragun (6), Hleb (6); Skavysh (6), Signevich (6), Stasevich (6). Substitutes: Tuominen (6), Moukam (6), Berezkin (N/A). STAR MAN - Dmitriy Baha had BATE's best chance of the game, when his first half shot smashed off the crossbar, leaving Arrizabalaga unmoved. He created BATE's best opportunities throughout the game, and was a key part of their attacks. WORST PLAYER - Alexei Rios should've drawn BATE level five minutes after going behind, and it would've been deserved after a strong performance. However, he blazed the ball over the bar, unable to find the back of the net like he did in the reverse fixture at Stamford Bridge. It was sure to be a tougher game than the reverse fixture at Stamford Bridge, but Chelsea were underwhelming at first. In the first half they struggled to find their feet, and although they weren't awful, they weren't quite up to scratch. However, Chelsea picked up in the second half, finally finding their stride on a cold night at the Borisov Arena. The Blues finally took the lead seven minutes after the break, when Giroud headed Emerson's cross in at the near post. It was a tough win but a deserved one, and Chelsea can return to London in good spirits. Starting XI: Arrizabalaga (7); Emerson (6), Cahill (6), Christensen (6), Zappacosta (5); Barkley (6), Jorginho (7), Loftus-Cheek (6); ​Hazard (6), Giroud (7), Pedro (6). Substitutes: Willian (6), Kovacic (6), Hudson-Odoi (N/A). STAR MAN - Giroud got the nod ahead up front for the trip to Belarus, and he rewarded Maurizio Sarri with his first goal of the season. After a frustrating first half where he missed some big chances, Giroud woke up in the second half. Seven minutes into the second half, he brilliantly headed Chelsea in front, finally opening his goalscoring account for the season. He was key to the Blues' victory tonight, and might have just given Chelsea fans confidence for the rest of the season. WORST PLAYER - Chance after chance, cross after cross was wasted by Davide Zappacosta, who was just wasteful on the wing. Defensively he was mediocre, but going forward he didn't add anything to the Blues' attacks, only giving possession away at every opportunity. Chelsea travel back to London to face ​Everton, who they host on Remembrance Sunday. They are then back in Europa League action on 29 November, with the visit of PAOK at Stamford Bridge. BATE Borisov have already won the Belarusian Premier League, securing their 13th successive title with three games to go. They next host Gorodeya in the Belarusian Cup, and return to the Europa League on 29 November when they host Vidi.